A mattress protector may not be the more glamorous item in your bedroom, but it’s importance is essential to make sure you protect your expensive mattress investment. For this review and test I took a look at Naturepedic’s waterproof organic mattress protector. Naturepedic has tried to create a protector that both protects, but also does so using healthy and hygienic materials. Can the Naturepedic mattress protector live up to the test? Find out below in my complete review! In a hurry? Click here to jump to the review summary for the quick version. The Natureperdic organic waterproof mattress protector is built from two layers of stretch knit organic cotton fabric. The fabric is designed to protect your mattress by absorbing liquid into the protection core, keeping it securely away from the mattress itself. The protector features Naturepedic’s DrySleep technology, which blocks liquids, but allows the mattress protector to still breathe, keeping the sleeper cool. There is zero vinyl, PVC, rubber, phthalates, or other chemical based repellent layers. Within the center of the mattress protector is an ultra-thin barrier. This material (which features the DrySleep technology) is what ultimately protects your mattress from liquid damage. With regards to build quality, the Naturepedic organic waterproof mattress protector feels extremely well made. Many mattress protectors have a certain cheap feel to them. This protector feels more like a thicker fitted sheet than a traditional mattress protector. The material construction and sewing looks and feels very robust. It’s also machine washable and machine dryable. Comes in all standard sizes including: Twin, Twin XL, Full, Queen, King, and California King. Also is available in two depth sizes, standard, which fits up to 12″ mattresses. 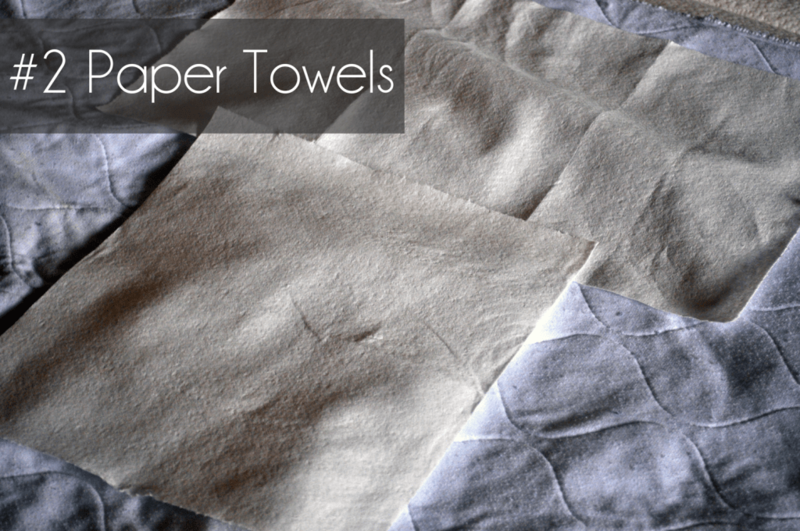 And deep pockets, which fits up to 17″ mattresses. Lastly, the mattress protector contains no flame retardants. At their most basic level mattress protectors have only two jobs. 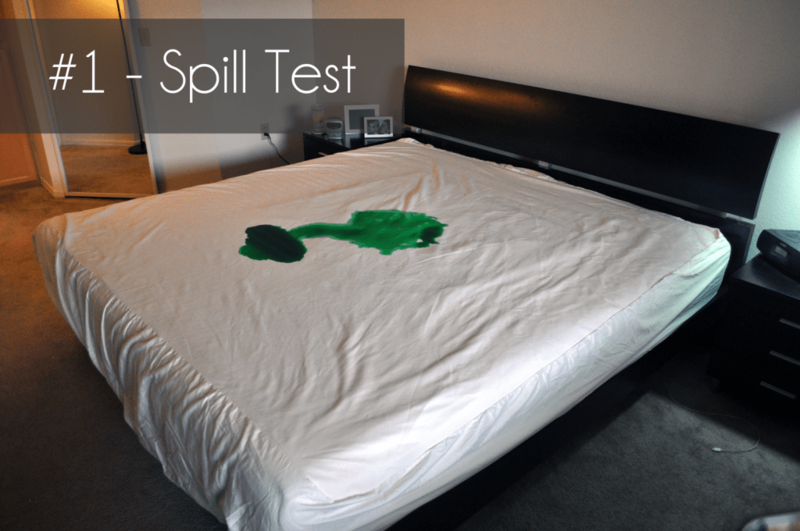 Perhaps the most critical level of protection that we all expect from a waterproof mattress protector…does it actually protect against catastrophic liquid spills? 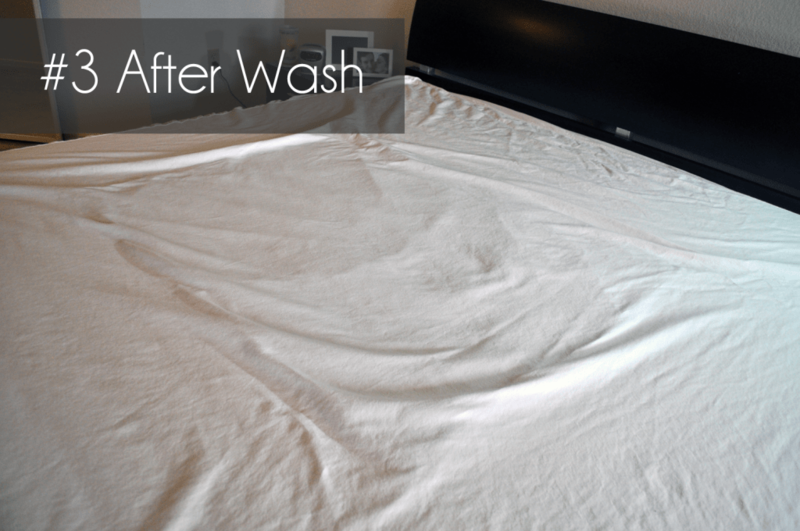 Protecting your mattress against liquids is essential. A single spill or accident could easily ruin a very expensive mattress in a matter of seconds. I put the Naturepedic waterproof organic mattress protector to the test with two separate liquid protection tests. The majority of common liquid spills take two forms…the quick spill and clean up, and the more dramatic spill that you didn’t realize even happened until hours later. This is the type of spill that you probably saw happen or may have even caused yourself. 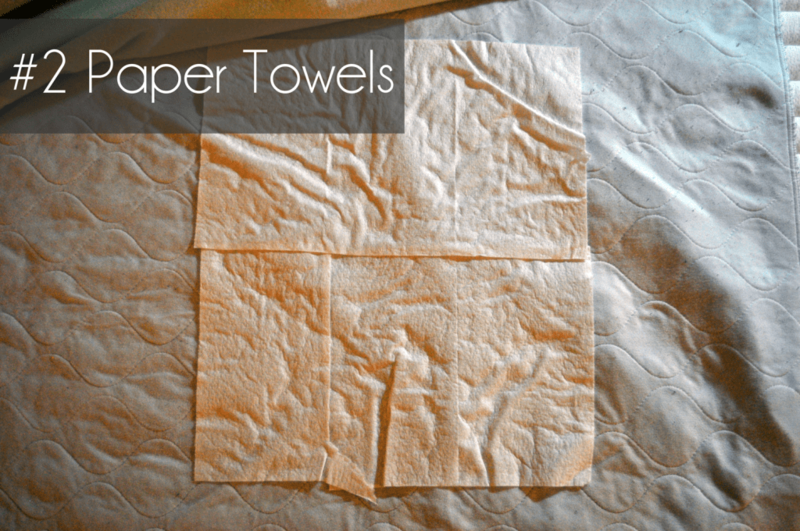 You may have had the accident and then quickly run to grab towels and remove the mattress protector. In this scenario the spill may soak into some areas of the protector, but much of the liquid will likely still be on top of the surface. This is the more catastrophic spill. Typically, it’s one that you may not have even realized happened. Examples could include your pets peeing on your bed while you are at work, a child having an accident during the night, etc. In this scenario the spill has ample time to soak into and potentially all the way through the protector. 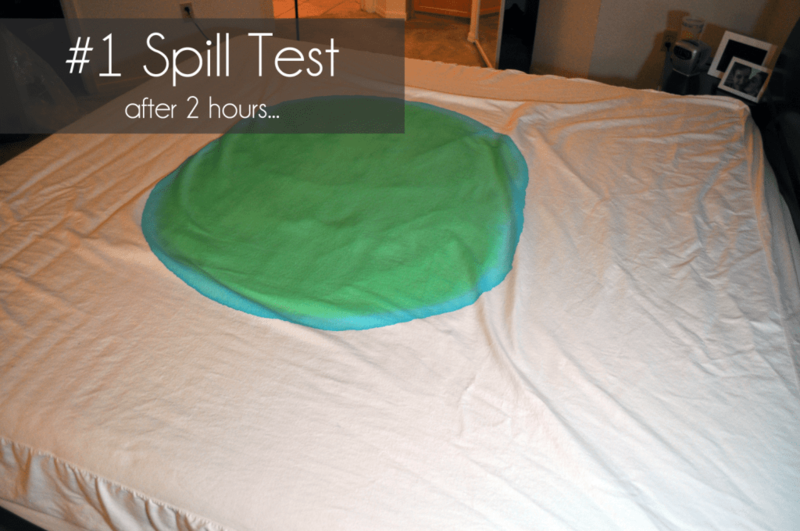 #1 – Spill Test using 16 oz. of liquid. This image is after just a few minutes. 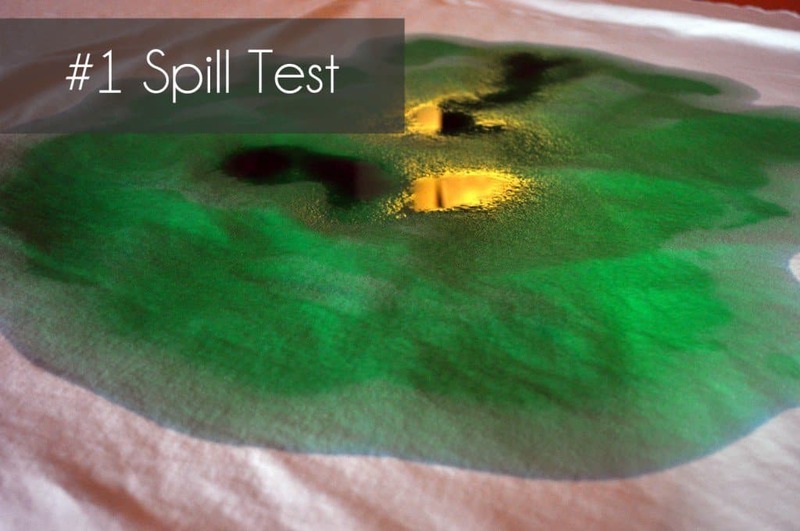 #1 Spill test, this image was taken several hours into the test. At this point the liquid is fully absorbed. #2 Paper towels at the conclusion of the 8 hour test. Zero liquid was able to penetrate the protector. 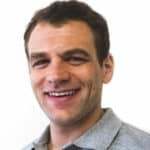 This is a difficult attribute to test during a short testing period. Since allergens, dust, and dirt slowly accumulate over time (years even) it will take an extended test to determine the success or failure here. That said, based on my initial impressions with the Naturepedic protector I’m quite impressed. The sheer build quality and material quality of this mattress protector should more than easily defend against dirt and dust particles. The top piece of fabric (which is also the liquid barrier) has a sturdy feel to it and more than met my expectations in my liquid test. If it’s able to keep liquids at bay I wouldn’t think there would be any long-term issue keeping allergens out. The Naturepedic mattress protector has strong elastic hold as well, which will help to prevent any particles from slipping through under your mattress. A good mattress protector’s first job is to protect the mattress, but the equally important second job is to do so while remaining invisible. If a mattress protector is causing the mattress to retain heat, reduce airflow, or create undue noise, the mattress protector isn’t really doing its job. At the end of the day, you don’t want an expensive mattress with great cooling features and comfort to be degraded by a mattress protector. The Naturepedic protector does a very good job in both noise and cooling. There was no discernible difference in our mattress’ cooling or excess noise created due to the protector. I attribute a large part of this due to the protectors design. The Naturepedic mattress protector feels a lot more like a slightly thick fitted sheet than a traditional protector. The liquid absorbing component sits within the center of the protector. This helps keep the material the would traditionally cause extra noise further away from the sleeping surface, reducing noise. This same technology (Naturepedic calls it their DrySleep) also allows air to flow through the protector, which helps maintain the cooling and breathability of your mattress. 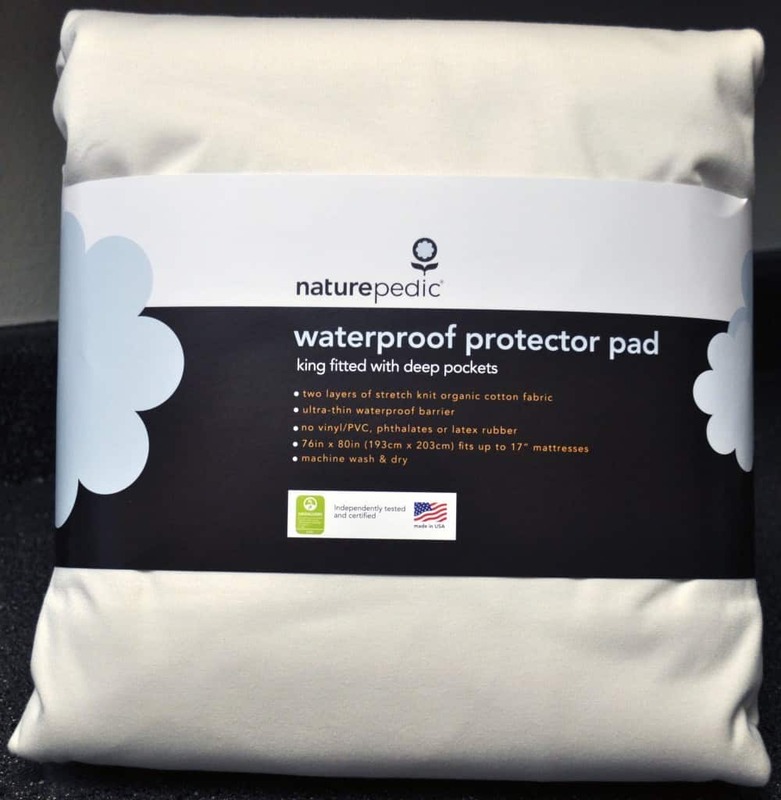 Should you buy the Naturepedic organic waterproof mattress protector? All things considered, I’m very impressed with the Naturepedic organic waterproof mattress protector. In my mind, mattress protectors have two simple, but critical tasks. 1) Protect the mattress and 2) Protect the mattress without changing the feel of the mattress. The Naturepedic passes both of these tests with flying colors. It’s a very well made protector that I would trust on any mattress. Want maximum liquid protection – in terms of liquid protection, I just don’t think it gets much better than the Naturepedic. It went a full 8 hours without allowing a single drop of liquid to penetrate the protector and get on my mattress. Want healthy materials – two layers of 100% organic cotton stretch knit fabric. There is no vinyl, no PVC, no phthalates, and no latex rubber within this mattress protector. Want a quality product – before I even removed this protector from the package, it speaks quality. The material construction, build quality, stitching, and performance are all impressive. It’s not cheap, but it’s the type of product I feel that I could count on to reliably perform for the life of my mattress. For more information and to shop for the Naturepedic waterproof organic mattress protector visit Naturepedic.com or order on Amazon.com. The Naturepedic waterproof mattress protector is everything a mattress protector should be. It does an exceptional job of managing liquid spills, is built from excellent materials, and doesn’t cause the mattress to heat up / make excessive noise during the night. The organic material construction is another significant selling point and will help to ensure your sleeping surface remains as healthy as it is comfortable. A very well made protector from a reputable company.